Up for sale is a very nice condition Minolta or Sony Mount Vivitar Auto Focus Illuminator 636AF Flash Unit. Comes with flash diffuser. Flash shoe is in very good condition. Some minor marks from normal use. Looks in good shape. Fires up fine with new batteries. Works fine when tested on a camera. 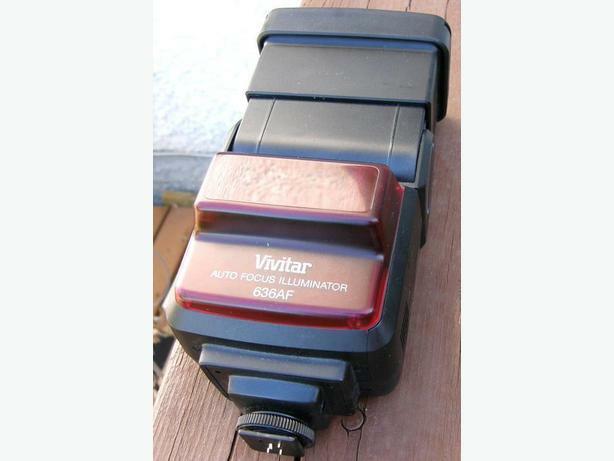 This is a nice item to use with your Minolta or Sony camera. Can be used on digital cameras also with proper adapter may be required. $20.